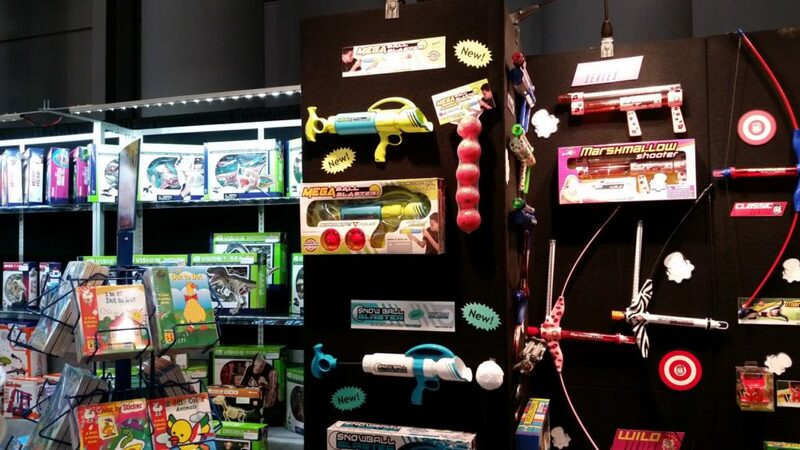 After doing more reading and more discussions, here’s part three of our Toy Fair Coverage. 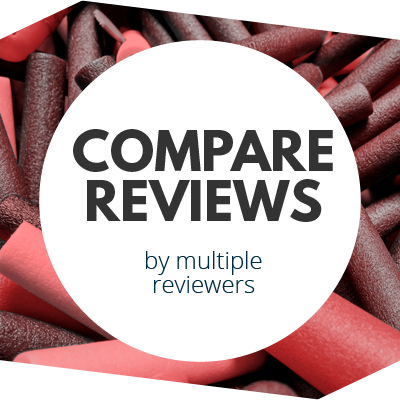 This post will focus on several lesser known blasting toy companies, or at least ones that don’t always come to mind. Why not start with Marshmallows? The Marshmallow Blaster is known for reliably shooting giant marshmallows up to forty feet. It’s now being replaced by the Extreme Blaster, which goes for a one-handle design that ends up using less plastic and can have a slightly lower price. In the marshmallow version, loading is performed via a break action mechanism. I’m sure some modders would be thrilled at the idea of a powerful air blaster with easy reloading. The MFC is firing more than sugary sweets, however. The new blaster design uses muzzle loading for giant ball and fabric snowball versions. In addition, one upcoming version will (by natural extension) fire tennis balls for the canine companion in your life. 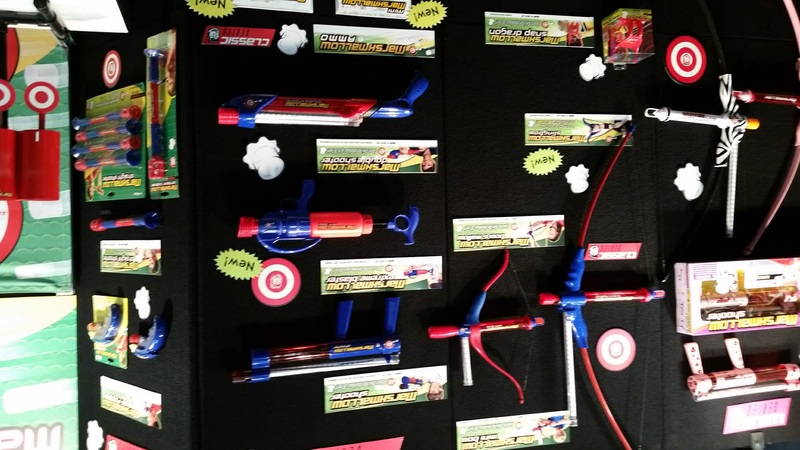 MFC has already begun selling giant marshmallow slingshots. This will be applied to other ammo types as well. 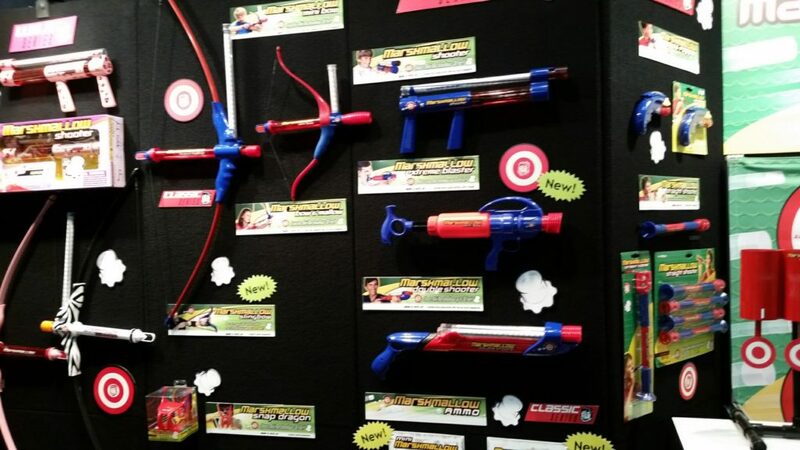 Various items like the Bow and Mallow and the standard Marshmallow Shooter will of course still be around. In essence, while things are indeed changing, much will stay the same. But how much change do you really need if you have a successful product? There honestly isn’t much to report on this front. 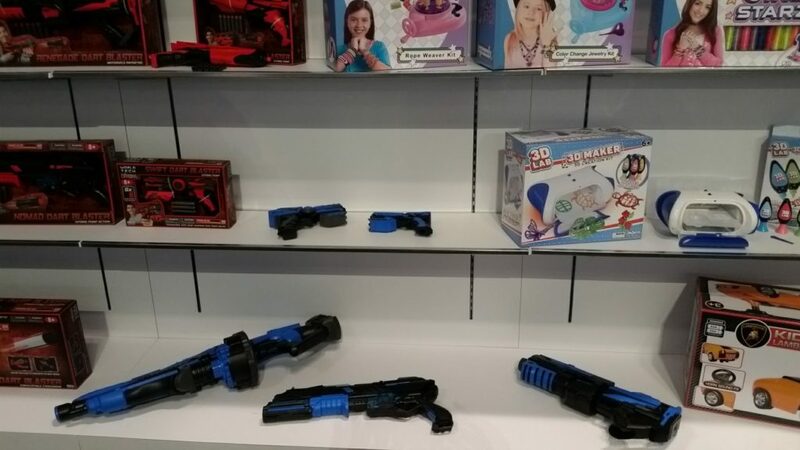 World Tech Toys, in addition to their R/C products, sells versions of Chinese blasters here in the United States. 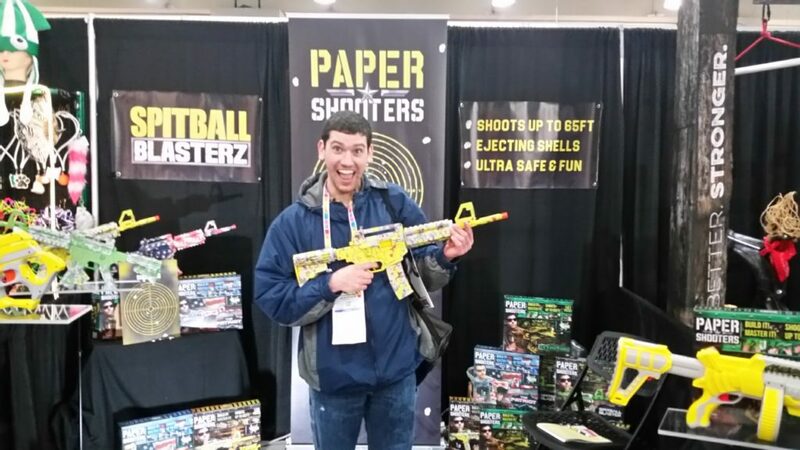 Our review of the “Sniper” blaster can be seen here. The current line was on display, however there were versions in new colors. Anyone feel an affinity for blue? If anything, it wad nice for them to have a presence at Toy Fair. 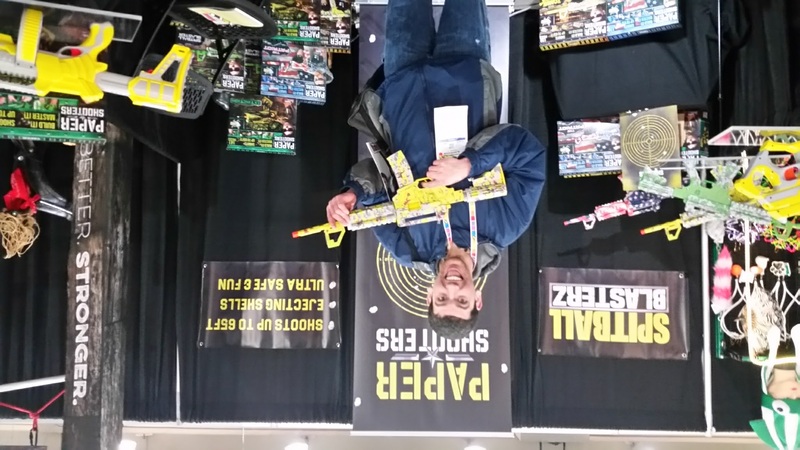 For those of you who don’t know, Paper Shooters is a product that has been on a development roller coaster ride. 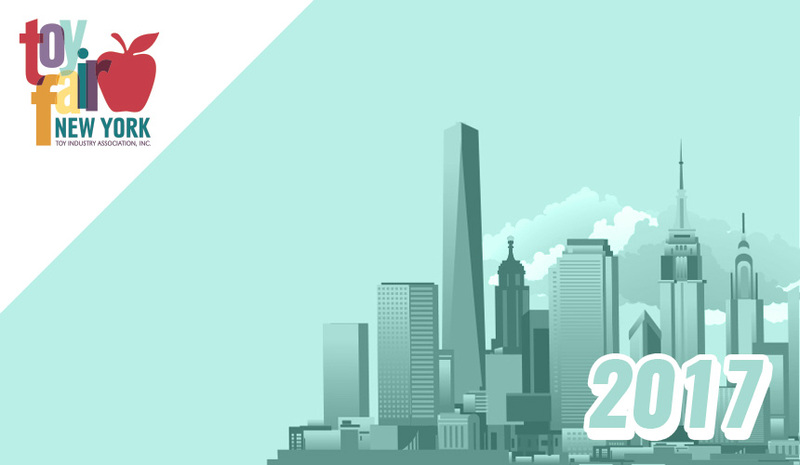 It began with a crowdfunding campaign, but has seen multiple bids for funding after reengineering efforts. 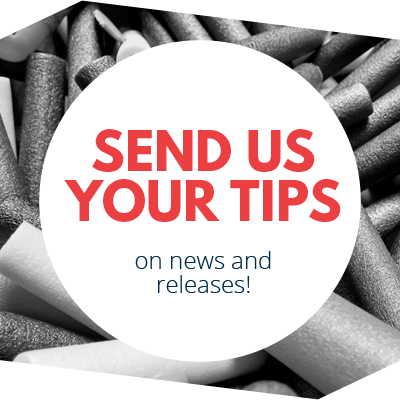 In addition, small biodegradable ammo that isn’t always felt on impact can be a turnoff for diehard blaster fans. 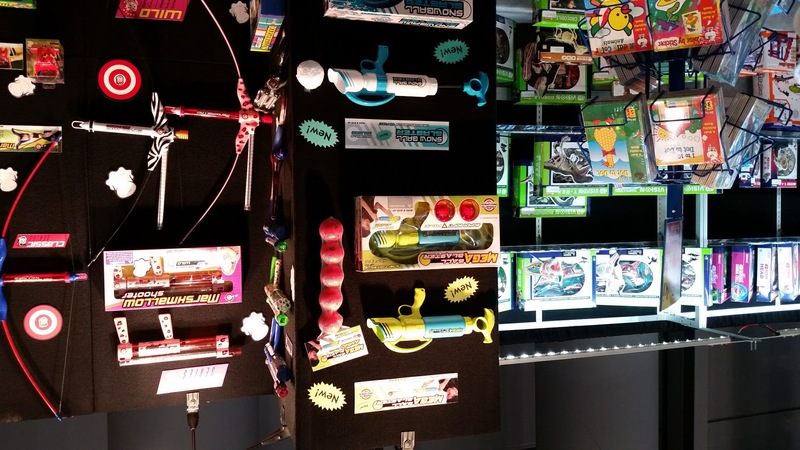 Nevertheless, Paper Shooters are at Toy Fair for the second year running, with new products in tow. The DIY blaster kits are still available, but newer models like Extinction are aiming for a more sci-fi feel. Meanwhile, there is still a demand for blasters ready to fire out of the box. 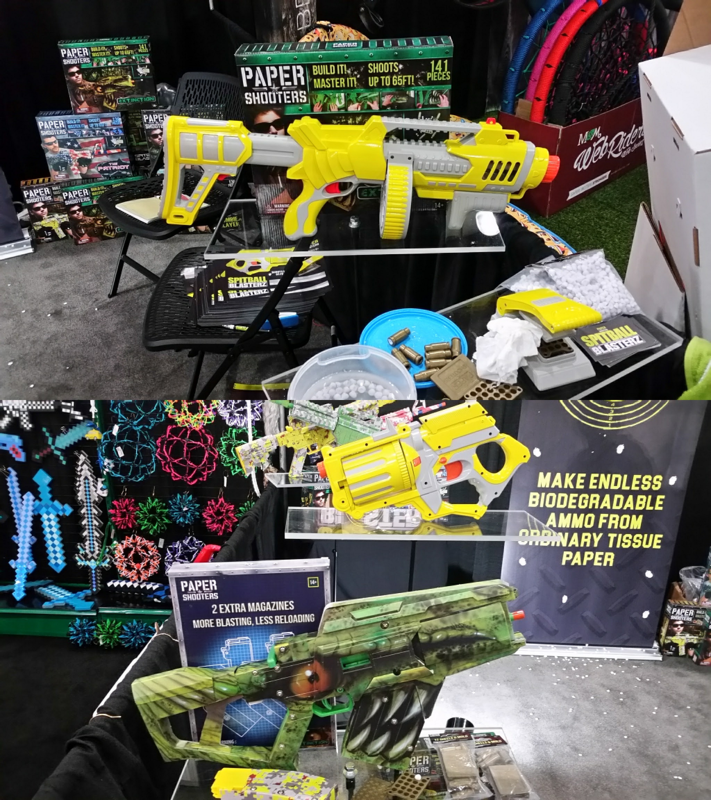 For those consumers, Paper Shooters has designed all-plastic models. One is a twelve round revolver; the other is a rifle with a thirty-two round drum. Both of these models forego the ejecting plastic shells of the DIY models. Although production itself had hit a few snags, thanks to help from the people at Marshmallow Fun Company, these models should both be available later this year. This last entry for the post may not be familiar. The products’ roots, however, will be. 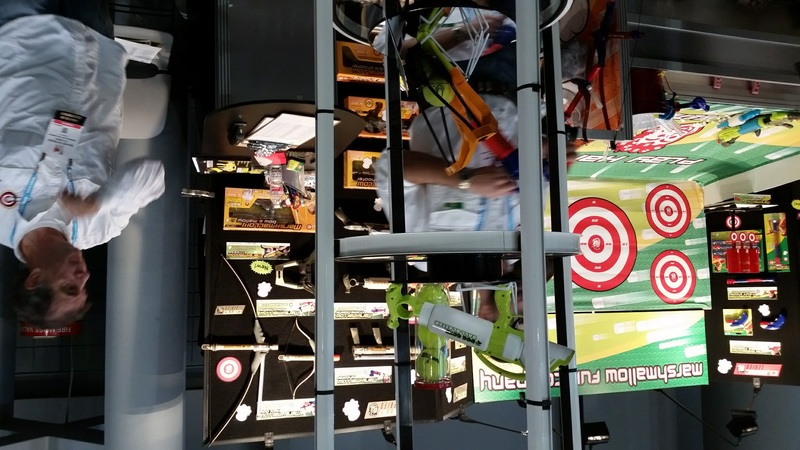 The inventor of the original Nerf Bow n Arrow (long before Nerf was a Hasbro brand) created an updated version using a more powerful plunger tube and a fake wood mold for the shell. 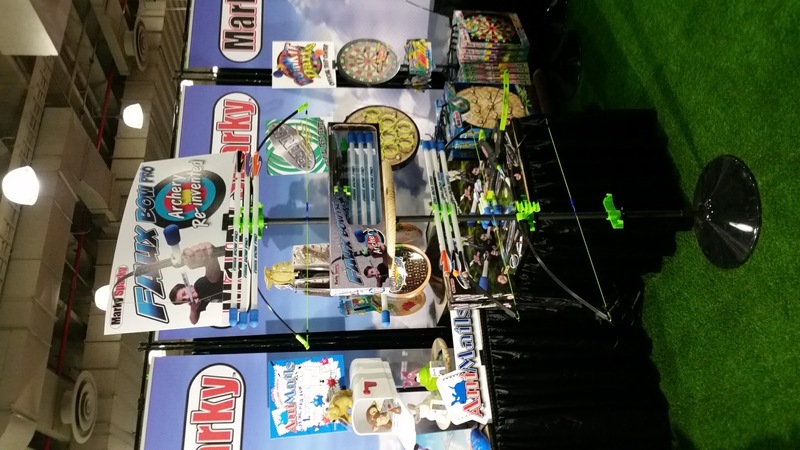 This year, Marky Sparky had versions two and three on display and ready for wholesale order. 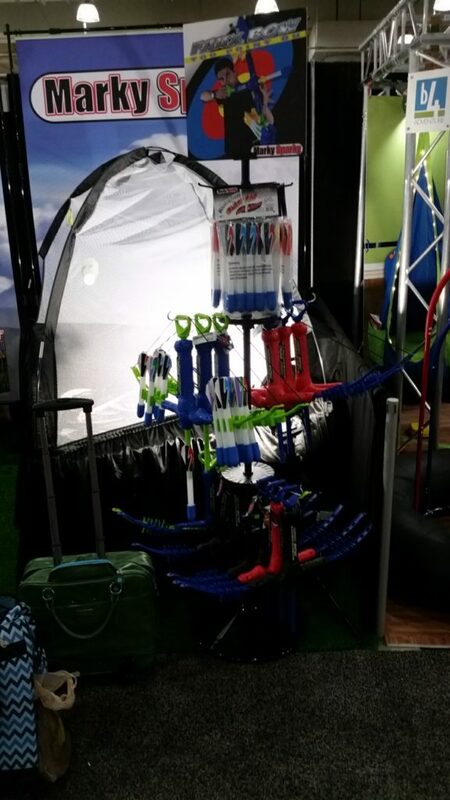 Number two had more available colors and toy arrow storage, while three was stronger than the previous models. It should be noted that, while I didn’t get a chance to compare the versions to each other, I have several Faux Bows at home, modified with RSCBs and homemade darts, and they have competed with plenty of NIC blasters both in the United States and Canada, So while most Nerf fans may initially pass, there is plenty of raw power available in the Faux Bow line. 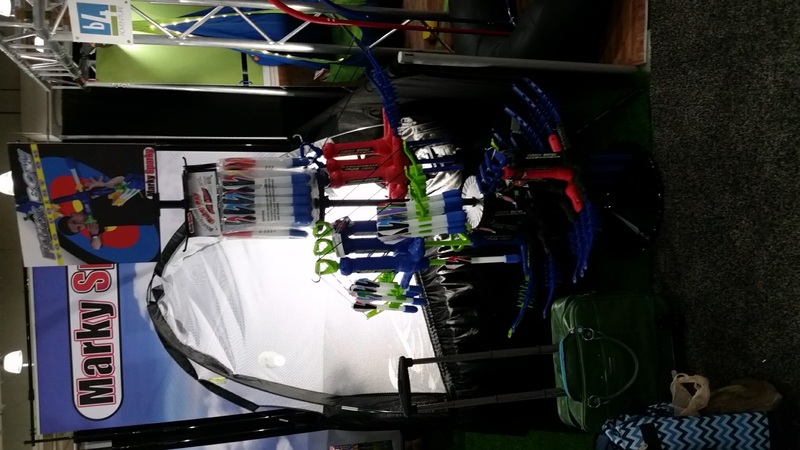 Finally, there was a “Pro” version on display, with new toy safety arrows designed for use with a regular bow and distances of up to 200′. Granted, it is proprietary ammo, but that much distance with foam-padded projectiles would be hilarious to see at a war if the user hit their targets. Inevitably, for the sake of not overloading with info, not everything I’ve seen so far has been written up. 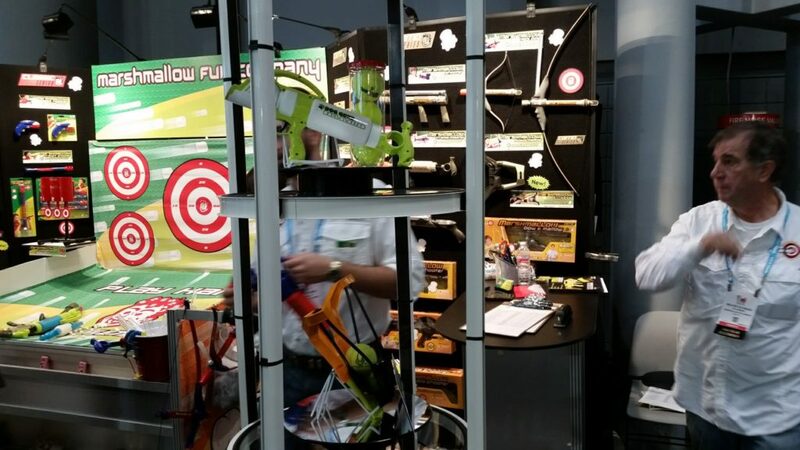 There was the Rival ball-shooting robot from New Bright, and Chinese manufacturers that were recycling old designs or making terrible translation mistakes in their promotional flyers. When I do my future “Best of Toy Fair” post, I’m fairly certain those will be in the running for “Biggest Fail”. In the meantime, Blasterhub has meetings scheduled with Hasbro in the morning, and an event with Buzz Bee Toys in the afternoon. You’ll have our take on the news then. 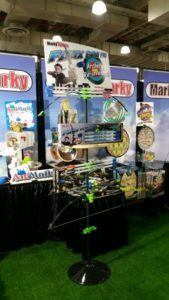 In the meantime, feel free to peek at a few other Nerfers who have been wandering Toy Fair and giving their thoughts! 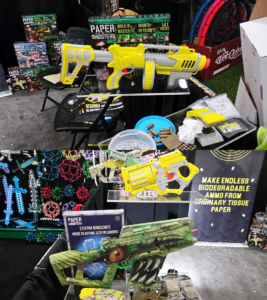 This entry was posted in News/Updates and tagged 2017, toy fair on February 19, 2017 by BuffdaddyNerf.